Three endangered sea turtles that had stranded on Cape Cod late last autumn due to hypothermia and other life-threatening medical conditions finally completed their long rehab at the New England Aquarium’s sea turtle hospital in Quincy. On early Wednesday evening, Gusty, Swell, and Geyser were placed onto the soft sand of West Dennis Beach about 25 yards from the water. After a few moments when they paused to take a breath, they eventually scampered down the sand toward the sound and odor of the lapping Atlantic surf directly in front of them. 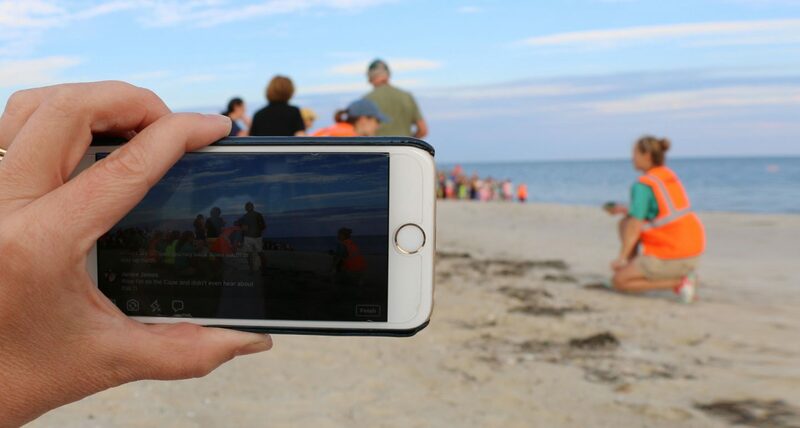 Over the course of a couple of minutes, they paddled their way through the sand to the breaking waves and immersion into an ocean in which they have not swum in more than eight months. 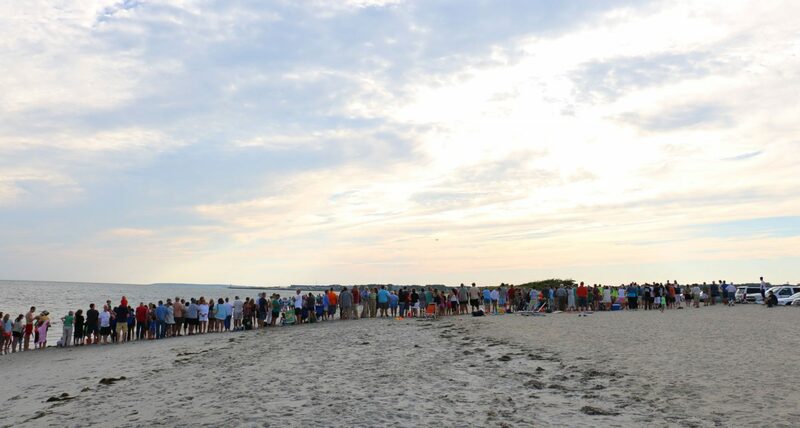 A large crowd assembled to watch the turtles return home. The two loggerhead turtles and one Kemp’s ridley sea turtle are among the very last of more than 300 cold-stunned sea turtles that were rescued late last autumn by the staff and volunteers of the Mass Audubon Wellfleet Bay Sanctuary and then re-warmed and treated at the Aquarium’s satellite animal care facility in the old Quincy Shipyard. 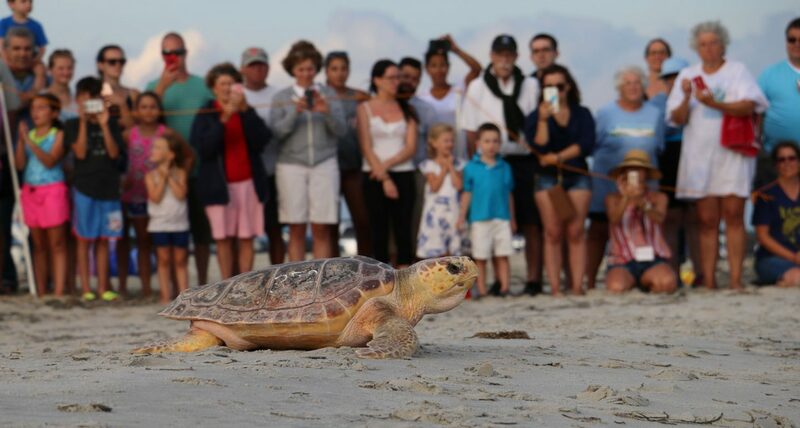 Most of their fellow, cold-stunned sea turtles were rehabbed and released in southern states late last winter or early in the spring. These three sea turtles all suffered from complications of a very persistent pneumonia. 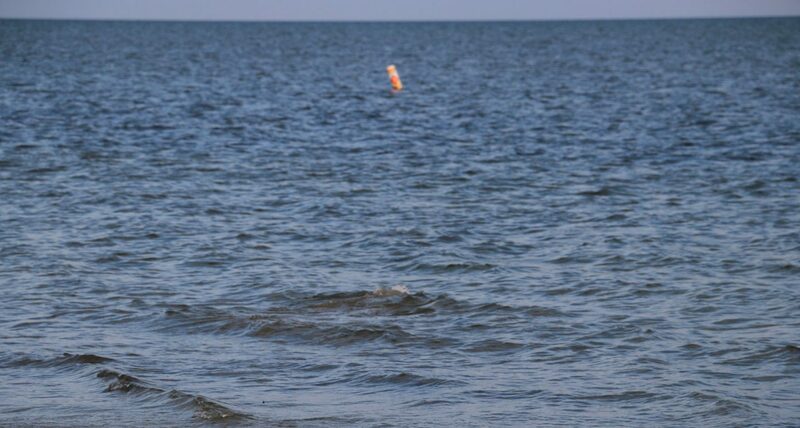 Gusty is a rambunctious 92-pound loggerhead that was found on Linnell Beach in Brewster last December 10. Swell, an 85-pound loggerhead with a pretty, brown shell, washed up on Silver Springs beach in Eastham on Christmas Day. 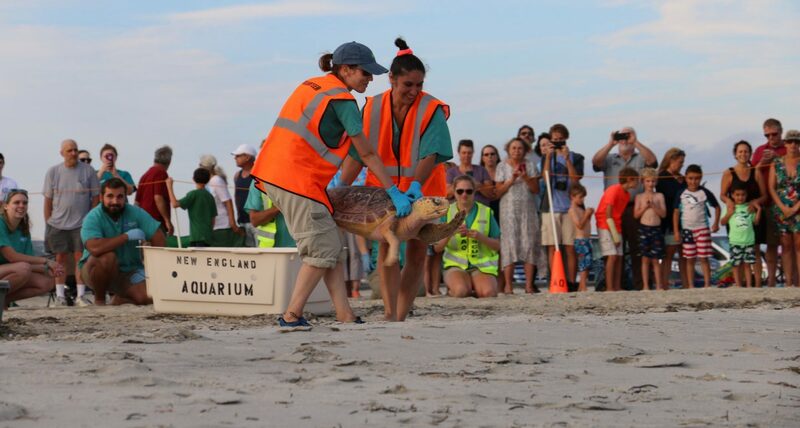 Geyser is a 20-pound Kemp’s ridley that stranded on Millway Beach in Barnstable last November 27. Kemp’s ridleys are the most endangered sea turtle species in the world. Two volunteers are needed to heft the large loggerheads out of the crates and onto the sand. The turtles each scrambled down the sand toward the water. A ripple over the shell is the last splash seen of the turtles as they swim out to sea. 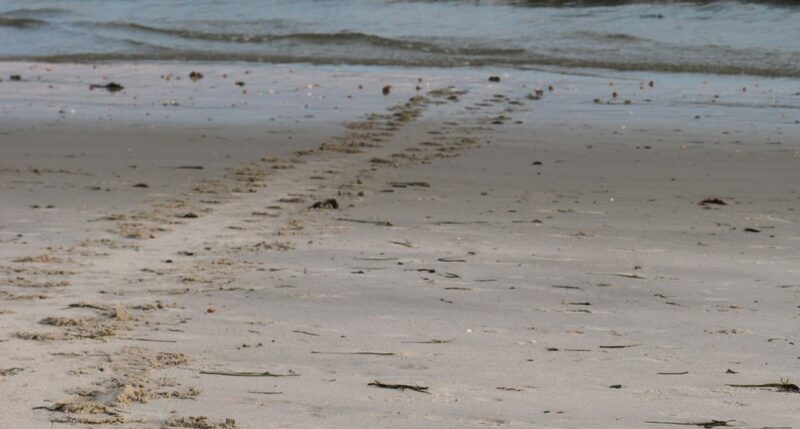 And we're left only with turtle tracks, an unusual sight on Cape Cod beaches.